Day 2 – nightfall : All six of us gathered in one room to watch a family movie. In its entirety. The whole thing. All six of us stayed in one room and watched a movie from start to finish. The cable continued to function so why the wifi wasn’t working remained an unsolved mystery. Day 3 : I saw workers on the side of the highway working on what I presume is the internet access box to our area. They’d been there for a few days but in my frantic mom taxi state I hadn’t paid them any attention. 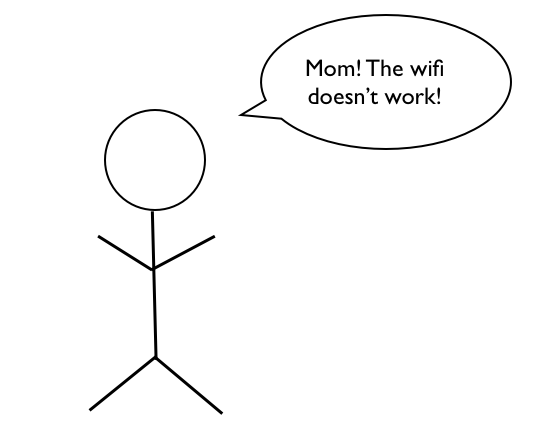 As they were still working I had an answer to the now familiar, “Mom, the wifi STILL isn’t working.” statement. Day 5 : Okay now I am getting annoyed. I’m trying to post reviews, download books to review, and write a blog post for the first time in months. And I can’t. Well I can, but I can’t post them from home. I actually went to a coffee shop to work on quickbooks. Hey…this whole gig isn’t too bad. Cheap but fabulous coffee, comfy chairs, and headphones….I may have to keep the wifi unplugged after they fix it! Nah – I like to write my blog posts in the middle of the night and I doubt Caribou would appreciate me knocking on the door at 3am. Day 7 : “Did you deal with Baldwin yesterday? I told Eldest to ask you.” Dr. Evil replied, “I told him to ask you to deal with it.” Grrrrrrrrrrrrrrrr. Day 8 : “Hi. This is Joy. Our wifi hasn’t been working in over a week since we saw people working on the box near our home. Our cable appears to be functioning, although poorly and for the price of the service this is also unacceptable. Our upload and download speeds have been well below the parameters for which we signed up. Please let me know your plan and how this will be addressed on our bill next month. We’ve been without the full service we pay for for more than a week.”I would greatly appreciate a call back. Day 9 : Found a yellow “We were here while you were away” service card. I was informed our router was bad. It’s not. I know it works. However we had been completely disconnected from the network and had to go through the log in process that is a “one time” thing when you initially sign up for service. Once Dr. Evil figured that out we were cooking with gas again. Doh! Wonder how long we were really and truly without service. Our neighborhood has a Facebook page (shut up – it’s awesome!) and there were comments the first few days about lack of service but nothing after Day 3. Oh well, I’ll happily take the extra time I got to see Eldest’s face at unusual times of the day. And even now that it’s working, he’s making more appearances, flopping on the couch and hanging out. I totally dig being sort of unplugged. EJ out – to return a video more than a week overdue! Hello library fines! Christa's Luck – A Review and GIVEAWAY! LOVE that unexpected family time. But I’m secretly glad you’re back online! Sometimes I wish for the wifi to go out. It can be good for everyone!